Christmas is much more than a day, isn’t it? It’s a package. We don’t only celebrate Christmas on the 25th, we celebrate it from the 1st, and some even celebrate it before that! To get in the spirit of things, we’re going to contribute to this today. We’re going to talk about Father Christmas! Santa – although dependable over the years – has become somewhat unreliable in recent years; there have even been several films as to why he can’t deliver his presents! These suspicions don’t amount from nowhere, his reindeers are getting a bit too relaxed! As worried parents ourselves, we’re wondering whether the man in red needs to find a new mode of transport for his deliveries. Those reindeers are just too dependent on the magic of Christmas. We’re thinking – due to its tenacious dependence, longstanding brilliance, and total greatness – about suggesting to Father Christmas that he perhaps uses hot air balloons rather than those shoddy reindeers. Santa, a well-known facts man, he would need the stats, wouldn’t he? If we’re seriously going to consider proposing that he uses a hot air balloon rather than reindeers and a sleigh, we’re going to have to pitch it seriously. As everyone knows, Santa. Upon landing on a country, you can move at the speed of light, can’t you? Yes, you have to fly from one country to the other, but still, that’s better than us. It takes us mere mortals 10 minutes to walk to our local Tesco. So, as we’ve established in our stroke-the-ego moment to Santa, upon landing in each country, he can move at the speed of light, but not faster, meaning time will stand still. So all that’s needed to work out really is how long it will take our hot air balloon to travel around the world, landing at each country. In the past, men have travelled around the world in a hot air balloon in 11 days. But they didn’t land in every country; they had no presents to deliver, Santa’s cause is much stronger. The world has 195 countries, all need their presents. Even Madagascar, they have a population of near-25-million! A common myth that there’s nothing there other than animals. Landing in all 195 Countries? So let’s work it out on average for our big guy in red: he needs to stop by 195 countries and there are 24,901 miles to cover on planet earth. So we’re going to have to divide 24,901 by 195, which rounded up equals 128. So, Santa, it works out at 128 miles per country on Planet Earth. Did you know that? 128 miles per country. Now we need to work out the speed this hot air balloon is going to move at. Once again, to make this a simple proposal to Santa, we’re going to need the world’s average wind speed. Which, in a study conducted by NASA, was proved to be 11 MPH. If Santa’s moving at 11 MPH and there’s a country on average every 128 miles of the world, it’s going to take him 11 hours and 38 minutes per country. 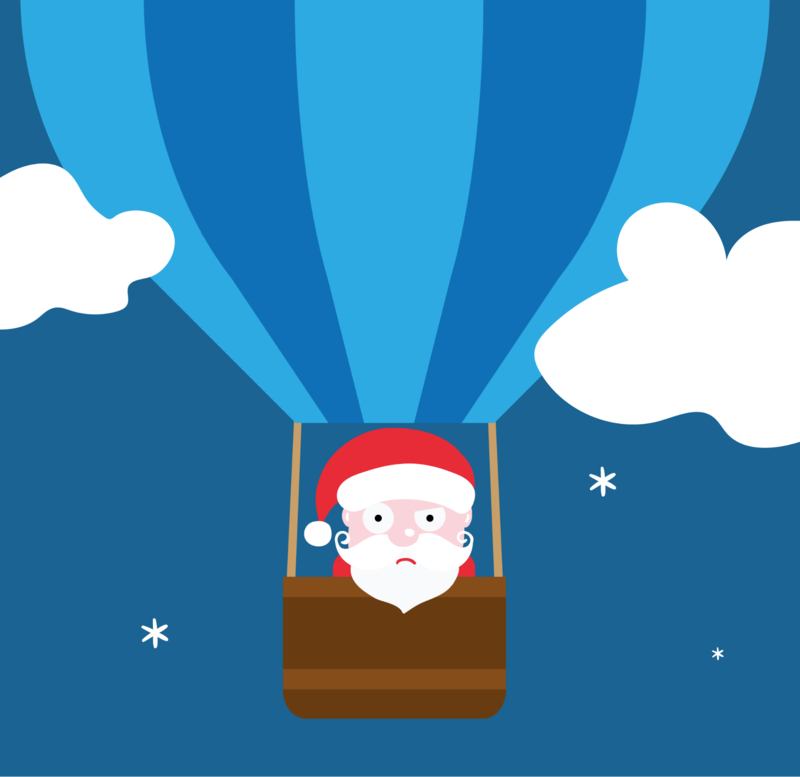 In our hot air balloon, Santa, you’re going to be moving at 11 MPH on average. And as we said, there’s a country per 128 miles considering the number of miles on Planet Earth, the home of your unparalleled greatness. We’ve got to stroke that ego. … Santa, stop shouting. We know you’re busy this time of year. We thought you might like a change. Hot air balloons are great… Yeah, we’re aware of how much quicker your reindeers are. We’re sorry, Santa. Sant… Stop shouting….. So, we may not have been able to convince Santa to utilise our hot air ballooning services for the busiest time of his year, people would still be getting their presents late into March. But we’re hoping that we can convince you! If you’re interested in gliding through the air in an exciting hot air balloon ride (rather than delivering the world their presents), have a look at our prices! It’s a grand experience, and we operate over Devon, Cornwall, Dorset, Somerset and Wiltshire. Why wait to see the world from new heights? Get in touch with our team or learn more here.